This walkthrough uses the StoreSales table from the Reels database. By default, in ActiveReports, the Reels.mdb file is located in the [User Documents folder]\GrapeCity Samples\ActiveReports 13\Data folder. In the New Project dialog that appears, select ActiveReports 13 Page Report Application and in the Name field, rename the file as rptFunnelChart. In the DataSet Dialog that appears, select the General page and enter the name of the dataset as StoreSalesData. 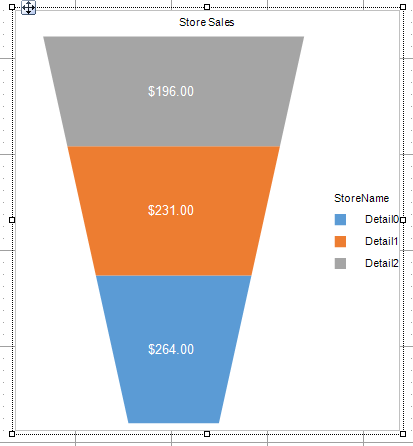 Right-click on the chart and go to Plot Template > Miscellaneous and select Funnel. Select the chart plot and go to Properties window. Go to Encodings > Values property and click ellipses next to Values property to open ValueAggregateEncodingDesigner Collection Editor. Add a new Value field to the collection editor. Open its Value collection editor and add a value field and set its expression to =Fields!TotalSales.Value. Click OK to save and exit the collection editor. You see that 'Total Sales' field is added under the Data Fields on chart. Go to Encodings > Details property and click ellipses next to Values property to open DetailEncodingDesigner Collection Editor. Add a new Detail field to the collection editor. Open its Values collection editor and add a value field and set its expression to =Fields!StoreName.Value. Click OK to save and exit expression editor and then again to close the collection editor. You see that 'Store Name' is added as Details encoding on the chart. Let us add legend to the chart. Select the chart plot and go to Encodings > Color > Values property. Click ellipses next to Values property to open the expressions editor. Select 'Chart title' on the chart and set Title to 'Store Sales'. Select Category axis and set Lines>ShowLine and Labels>ShowLabels to False. Select Value axis and set ShowLine and ShowLabels to False. Select Legends on chart and set Title to 'Store Name'.